LOS ANGELES (Reuters) - Netflix Inc, the world's dominant streaming service, will not make its TV shows and movies available through Apple Inc's upcoming video offering, Netflix Chief Executive Reed Hastings said on Monday. "We prefer to let our customers watch our content on our service," Hastings told reporters at the company's offices in Hollywood. "We have chosen not to integrate with their service." Apple is expected to unveil a television and video service at an event on March 25, a move that will amp up competition for Netflix and others that deliver entertainment programing online. Sources familiar with the matter have told Reuters that the service may resell subscriptions from CBS Corp, Viacom Inc and Lions Gate Entertainment Corp’s Starz among others, as well as Apple’s own original content. Walt Disney Co and AT&T Inc's WarnerMedia also plan to offer subscription streaming services. Asked about the looming competition, Hastings said the biggest challenge for Netflix is to "not get too distracted" by rivals but still "learn lessons" from them. "These are amazing, large, well-funded companies with very significant efforts," Hastings said. "They are going to do some great shows. I’m going to be envious. They're going to come up with some great ideas. We're going to want to borrow those." But, he added, "we will make this a better industry if we have great competitors." 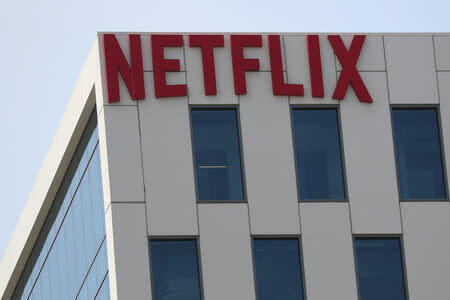 Hastings also said he expected Netflix, like other U.S. technology companies, to be blocked in China "for a long time."